The term “osteoporosis” is widely used clinically to mean generalized loss of bone, or osteopenia, accompanied by relatively atraumatic fractures of the spine, wrist, hips, or ribs. 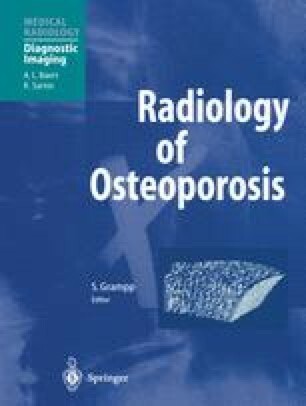 Because of uncertainties of specific radiologic interpretation, the term “osteopenia” (“poverty of bone”) has been used as a generic designation for radiographic signs of decreased bone density. Radiographic findings suggestive of osteopenia and osteoporosis are frequently encountered in daily medical practice and can result from a wide spectrum of diseases ranging from highly prevalent causes such as postmenopausal and involutional osteoporosis to very rare endocrinologic and hereditary or acquired disorders (Table 5.1). Histologically, the result in each of these disorders is a deficient amount of osseous tissue, although different pathogenic mechanisms may be involved. Conventional radiography is widely available, and alone or in conjunction with other imaging techniques it is widely used for the detection of complications of osteopenia, for the differential diagnosis of osteopenia, and for follow-up examinations in specific clinical settings. Bone scintigraphy, computed tomography, and magnetic resonance imaging are additional diagnostic methods that are applied almost routinely to aid in the differential diagnosis of osteoporosis and its sequelae.